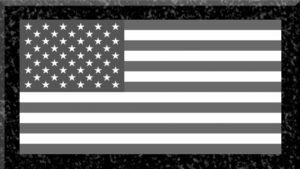 Honoring those who gave the ultimate sacrifice in support of the Global War on Terror while serving with the California National Guard. of the California Military Department. 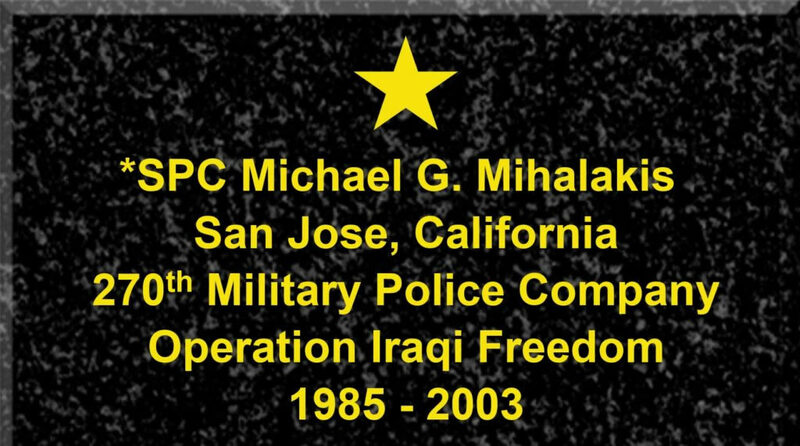 It is with deepest sympathy the California National Guard announces the death of Specialist Michael Mihalakis, age 18, on 26 December 2003 in Baghdad, Iraq. Specialist Mihalakis died as a result of a motor vehicle accident near Baghdad Airport. He is survived by his mother and father. 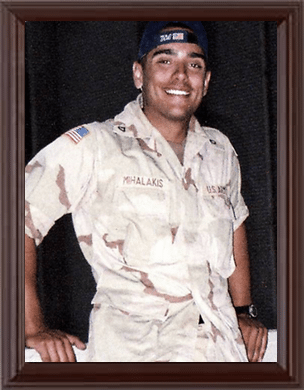 Specialist Mihalakis joined the California Army National Guard on 6 September 2002 and was assigned to the 270th Military Police Company. On 22 March 2003, was ordered to active duty in support of Operation Iraqi Freedom. 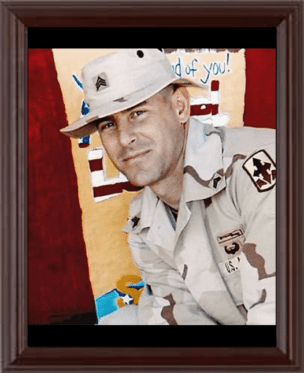 ​It is with deepest sympathy the California National Guard announces the death of Staff Sergeant David S. Perry, age 36, on 10 August 2003 in Baquabah, Iraq. Staff Sergeant Perry died when a suspicious package he was inspecting exploded. He is survived by his wife, Denae, and three children, Alyssa, Brandon, and Sean. 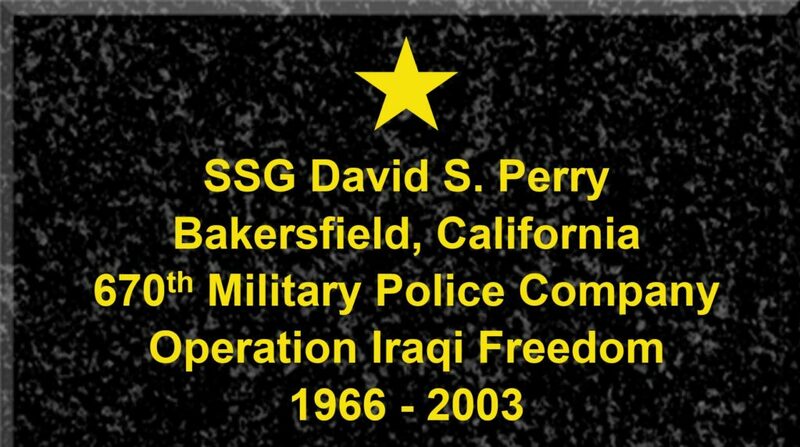 Staff Sergeant Perry is the first California National Guard soldier to die during Operation Iraqi Freedom. Sergeant Patrick R. McCaffrey, Sr. 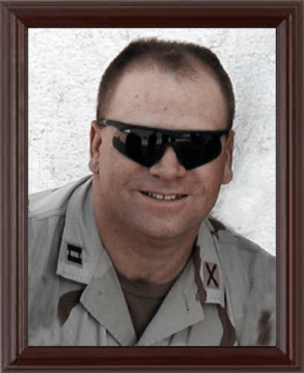 It is with deepest sympathy the California National Guard announces the death of Sergeant Patrick R. McCaffrey Sr, age 34, on 22 June 2004 Balad, Iraq. Sergeant McCaffrey died as a result of wounds received during an ambush while on patrol. He is survived by his wife Silvia, two children, and his father. 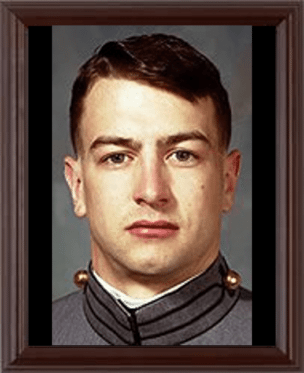 Sergeant McCaffrey joined the California Army National Guard on 11 October 2001 and attended basic training at Fort Leonard Wood Missouri. After basic training he attended and completed the combat engineer course. 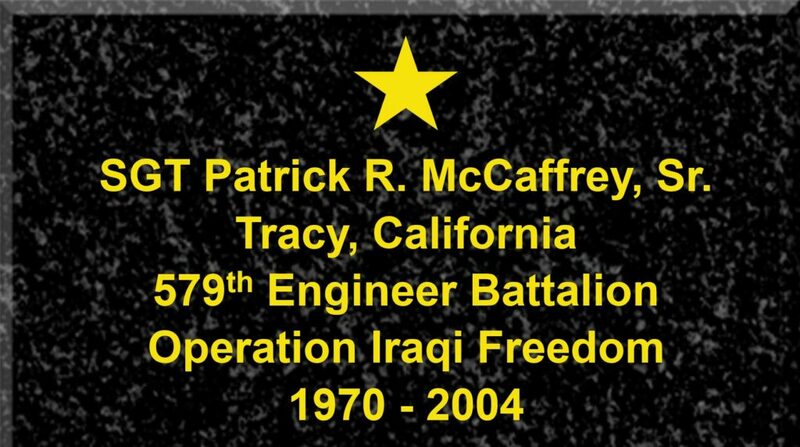 Sergeant McCaffrey was ordered to active duty in support of Operation Iraqi Freedom on 17 January 2004. 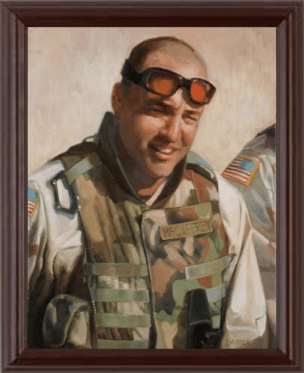 ​It is with deepest sympathy the California National Guard announces the death of Sergeant First Class Michael Ottolini, age 45, on 10 November 2004 in Balad, Iraq. 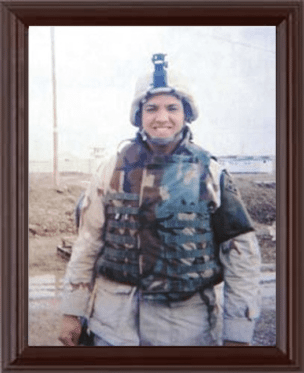 Sergeant First Class Ottolini died as a result of wounds received during an improvised explosive device (IED) attack while serving with his unit. He is survived by his wife, Sharon, and children Daryl and Stephanie. 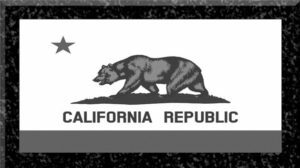 SFC Ottolini joined the California Army National Guard on 17 December 1976 as a combat engineer in the Headquarters and Headquarters Company, 579th Engineer Battalion, Santa Rosa. SFC Ottolini was ordered to active duty in support of Operation Iraqi Freedom on 17 January 2004. 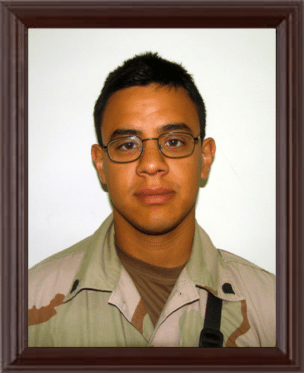 ​It is with deepest sympathy the California National Guard announces the death of Specialist Eric Ramirez, age 31, on 12 February 2004 in Abu Gireb, Iraq. Specialist Ramirez died when he was attacked by small-arms fire. He is survived by his wife Tracy, and children Isis and Chase. 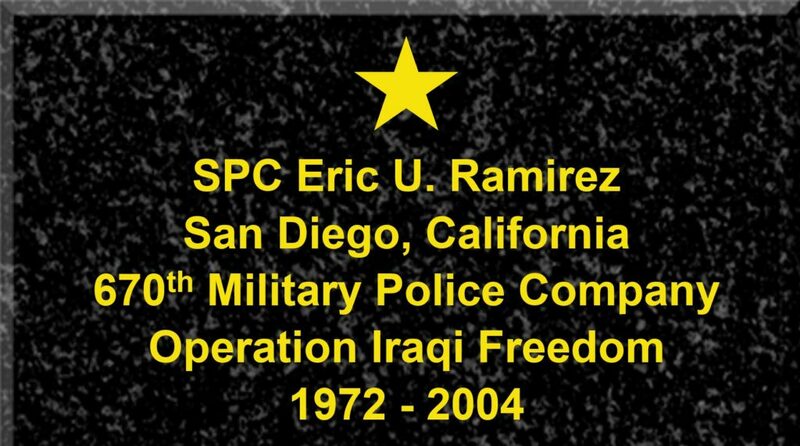 Specialist Ramirez joined the California Army National Guard on 13 April 1999. On 24 January 2003, he mobilized with the 670th Military Police Company in support Operation Enduring Freedom. Specialist Ramirez’s awards include the Naval Reserve Sea Service Ribbon, Sea Service Deployment Ribbon, Joint Meritorious Unit Commendation Ribbon, and National Defense Service Medal. 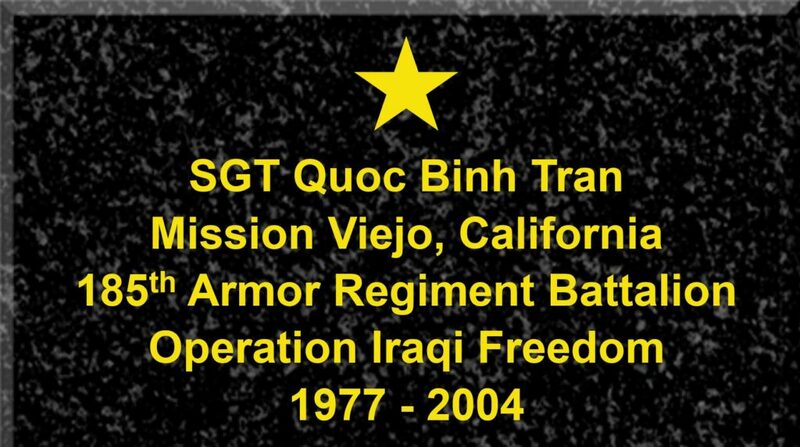 It is with deepest sympathy the California National Guard announces the death of Sergeant Quoc Tran, age 26, on 7 November 2004, in Baghdad, Iraq. Sergeant Tran died as a result of wounds received during an improvised explosive device (IED) attack while serving with his unit. He is survived by his father and mother. 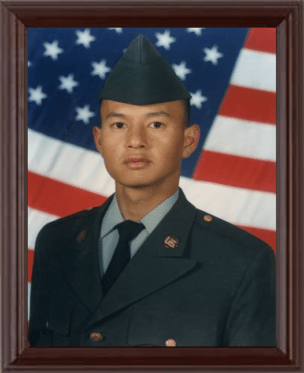 Sergeant Tran joined the California Army National Guard on 4 December 2002 after serving on active duty Army from 1996 to 2002. He was ordered to active duty in support of Operation Iraqi Freedom on 15 November 2003. 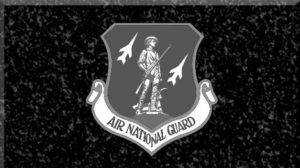 It is with deepest sympathy the California National Guard announces the death of First Lieutenant Andre Tyson, age 33, on 22 June 2004. 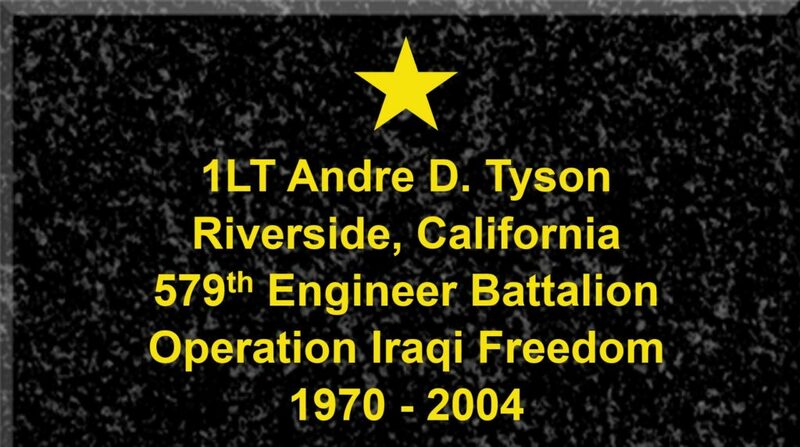 First Lieutenant Tyson died as a result of wounds received during an ambush while on patrol in Balad, Iraq. He is survived by his parents and sister. Lieutenant Tyson received his commission with the California Army National Guard, Company B, 578th Engineer Battalion on 26 August 2002. He was ordered to active duty on 15 November 2003 to serve in Operation Iraqi Freedom. 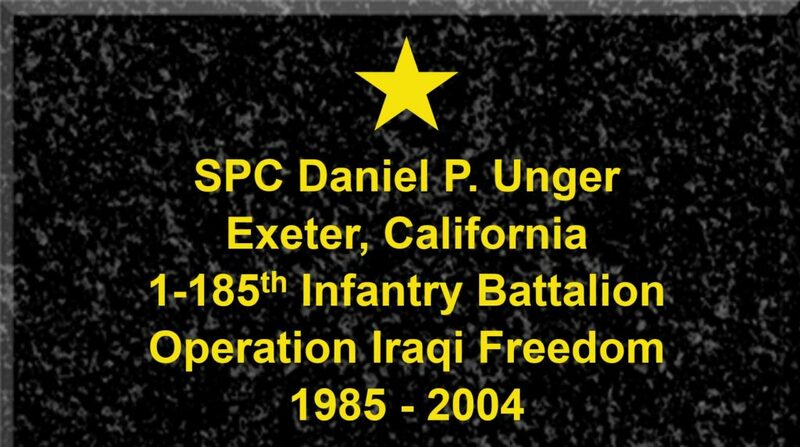 It is with deepest sympathy the California National Guard announces the death of Specialist Daniel Unger, age 19, on 25 May 2004 in Baghdad, Iraq. Specialist Unger died as a result of a mortar attack in Forward Operating Base Kalsu (Iskanariyah) Iraq. He is survived by his parents and sisters. Specialist Unger enlisted in California Army National Guard on 13 August 2002 and was assigned with Det 1, Co A, 1/185th Infantry. He was mobilized on 15 November 2003 as part of Operation Iraqi Freedom. First Lieutenant Vega joined the California Army National Guard on 29 January 2002 and assigned to the 223rd Military Intelligence Battalion. He was mobilized on 3 January 2004 in support of Operation Iraqi Freedom. Staff Sergeant Jerry L. Bonifacio, Jr. 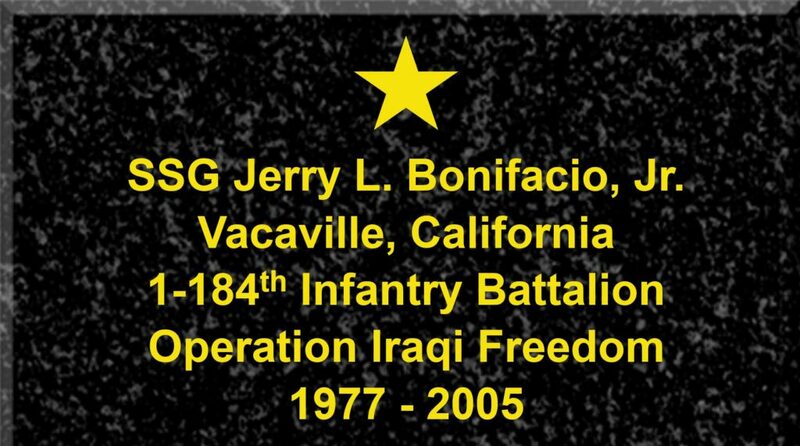 It is with deepest sympathy the California National Guard announces the death of Staff Sergeant Jerry L. Bonifacio, Jr., age 28, 10 Oct 2005 in Baghdad, Iraq. Staff Sergeant Bonifacio died when a vehicle-borne improvised explosive device detonated near the security checkpoint he was manning. He is survived by his parents, younger brother and sister, grandparents, and fiancée. 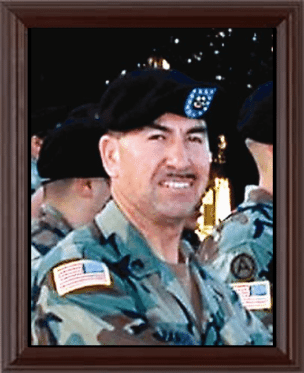 Staff Sergeant Bonifacio enlisted in California Army National Guard in 2001 with the 184th Infantry Regiment after leaving active duty Army in 2001. Staff Sergeant Bonifacio awards include the Air Assault Badge, three Army Achievement Medals, a Joint Meritorious Unit Award, a Humanitarian Service Medal, and a Multinational Force and Observers Medal. 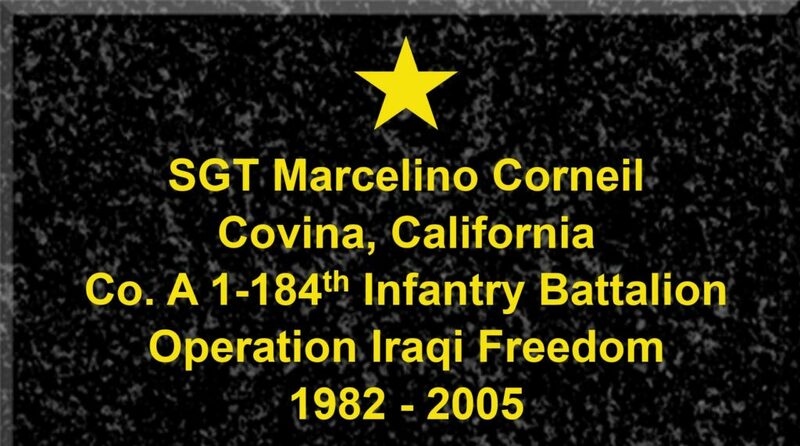 ​It is with deepest sympathy the California National Guard announces the death of Sergeant Marcelino Corniel, age 23, on 31 December 2005 in Baghdad, Iraq. Sergeant Corneil died as a result of an enemy mortar attack in the vicinity of his observation post. He is survived by his mother Janice Lopez, fiancé Claudia Calderon, sisters Kristen and Kimberly, and grandmother Geraldine. 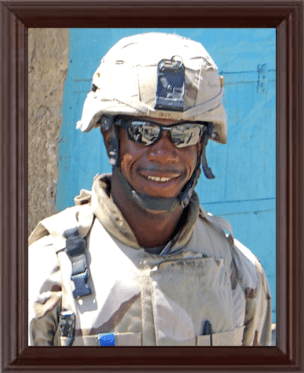 Sergeant Corniel enlisted in California Army National Guard on 17 June 2005 and volunteered to deploy with A CO, 1/184th to Iraq. Sergeant Corniel’s awards include the Bronze Star Medal, Purple Heart, Good Conduct Medal, Global War on Terrorism Medal, Iraqi Campaign Medal, Combat Infantryman Badge, Sea Service Deployment Ribbon and California Memorial Medal. 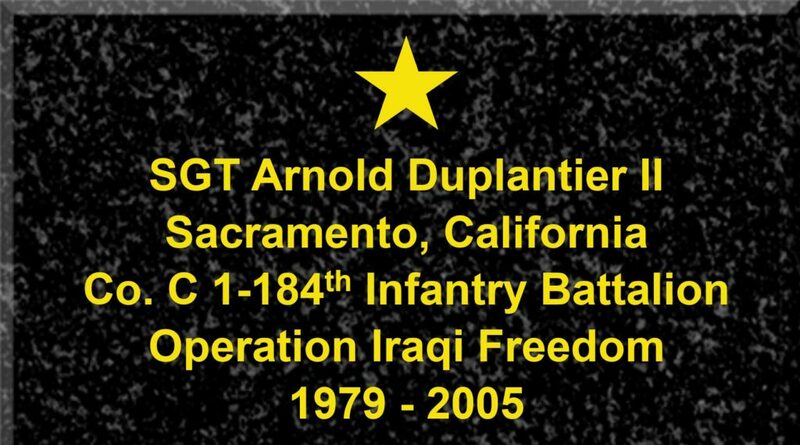 It is with deepest sympathy the California National Guard announces the death of Sergeant Arnold Duplantier, age 26, on 22 June 2005 in Baghdad, Iraq. 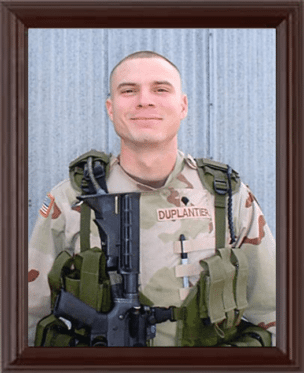 Sergeant Duplantier died as a result of sniper fire while on patrol with his unit . He is survived by his wife Tanya, children Isabel and Ethean, and his parents. Sergeant Duplantier joined the California Army National Guard on 29 April 1999. In January 2002 he was deployed to Kuwait for five months as part of Operation Desert Spring. After completion of this deployment he returned to his home in Sacramento. Sergeant Duplantier was ordered to active duty in support of Operation Iraqi Freedom on 16 August 2004. It is with deepest sympathy the California National Guard announces the death of Sergeant Shakere T. Guy, age 23, on 29 October 2005 in Baghdad, Iraq. Sergeant Guy died as a result of a roadside bomb exploding near the Humvee he was riding in during a combat mission. He is survived by his mother and sister whom he cherished dearly. Sergeant Guy enlisted in the California Army National Guard on 22 June 2000 as a tanker with Troop A, 1-18th CAV. He joined Delta Company, 1-184 Infantry on November 3, 2004 in support of Operation Iraqi Freedom 04-06. Sergeant Guy’s awards include the Bronze Star Medal, the Purple Heart, National Defense Service Medal with second award, Global War On Terrorism Service Medal, Army Service Ribbon, Combat Action Badge. 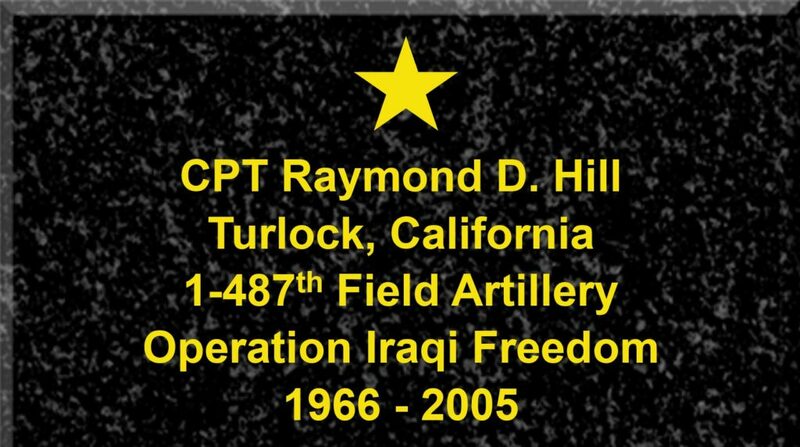 ​It is with deepest sympathy the California National Guard announces the death of Captain Raymond Hill, age 39, on 29 October 2005 in Baghdad, Iraq. Captain Hill died as a result of a roadside bomb exploding near his Humvee. He is survived by his wife Dena, daughters BreeAnna and Alyssa. 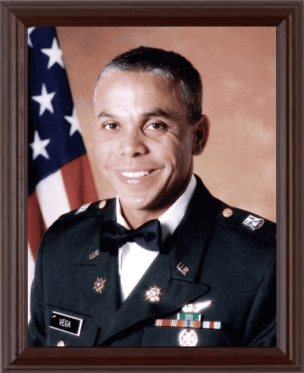 Captain Hill enlisted in the California National Guard in 1987 and was assigned to E CO 1-184th Infantry. He deployed with the 1-487 FA in August of 2004 and entered the Iraqi theater in January of 2005 where he served as the Battalion’s FSO, S7 and PAO. Captain Hill’s awards and decorations include the Bronze Star, Purple Heart, Army Commendation Medal, Army Achievement Medal, Combat Action Badge, Global War on Terrorism Expeditionary and Service Medals, and the Iraq Campaign Medal. 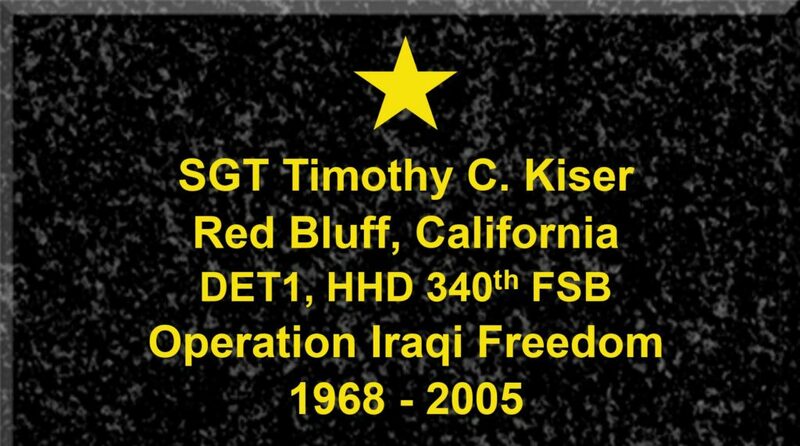 It is with deepest sympathy the California National Guard announces the death of Sergeant Timothy C. Kiser, age 37, on 28 April 2005 in Kirkuk, Iraq. 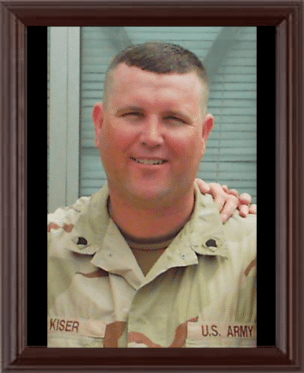 Sergeant Kiser died as a result of a roadside bomb detonating under his Humvee. He is survived by his wife Rhonda, children Austin, Jordan, and Kyle and Danyelle Thompson. Sergeant Kiser joined the California Army National Guard on 23 August 2004 after a break in service. He mobilized with the 578th Engineer Battalion, 40th Infantry Division on 27 November 2004. Sergeant Kiser’s awards include the Bronze Star, Purple Heart and State Memorial Medal. 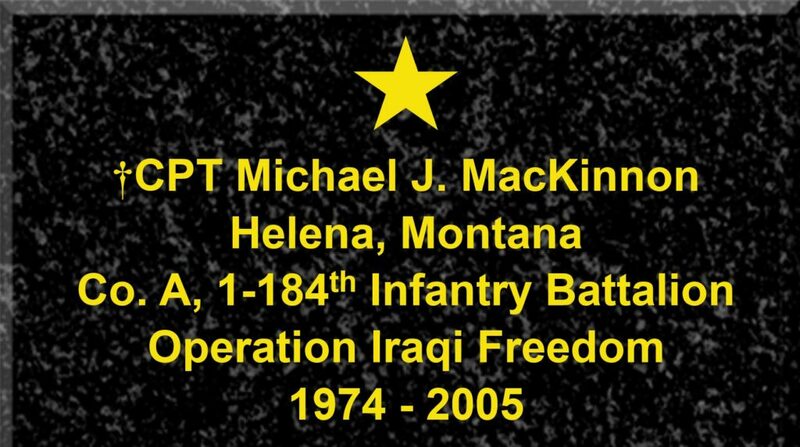 It is with deepest sympathy the California National Guard announces the death of Captain Michael J. Mackinnon, age 30, on 27 October 2005 in Baghdad, Iraq. 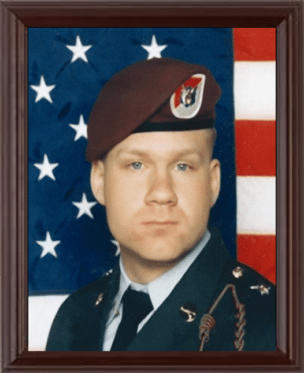 Captain Mackinnon killed when an improvised explosive device detonated near his Humvee during convoy operations in Baghdad, Iraq. He is survived by his wife Beth, father, and three sisters. Captain Mackinnon was assigned to head A Company, 1st Battalion, 184th Infantry of the California National Guard. 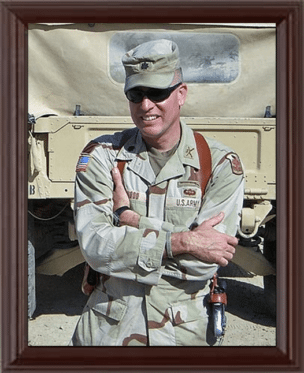 After graduating from West Point in 1997, he completed Ranger School, and was stationed at Fort Stewart, Ga. with the 4th Battalion, 64th Armor Regiment, 4th Brigade Combat Team, 3rd Infantry Division. ​It is with deepest sympathy the California National Guard announces the death of Staff Sergeant Paul Christian Neubauer, age 40 on 23 September 2005 in Baghdad, Iraq . 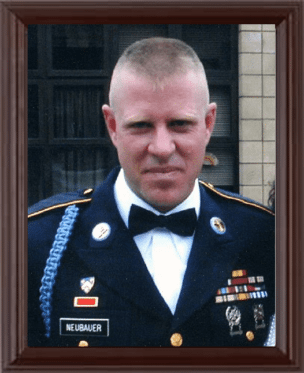 Staff Sergeant Neubauer died as a result of an IED and small arms fire. He is survived by his wife and a daughter, his father and a sister. 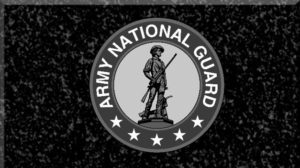 Staff Sergeant Neubauer enlisted in California Army National Guard in 1997 with Troop H, 1st Squadron, 18th Cavalry and elements of the 1st Battalion, 184th Infantry (AASLT). He joined Team Shield Counter Drug in 1999, and continued working with them until his mobilization. 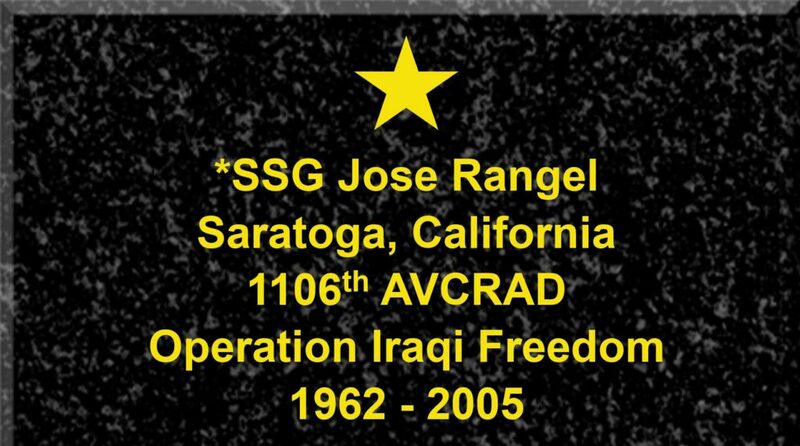 It is with deepest sympathy the California National Guard announces the death of Staff Sergeant Jose Rangel, age 43, on 23 January 2005 in Camp Arifjan, Kuwait. Staff Sergeant Rangel died unexpectedly of noncombat-related injuries while serving with his unit. He is survived by his wife Noemi and sons Randy, Michael and Andrew. Staff Sergeant Rangel enlisted with the California Army National Guard, 3 August 1988, Company A, 3/185th Armor. He was also invaluable for his language skills and worked as an interpreter for the 1106th AVCRAD while training with the Mexican Defense Forces to repair UH-1 helicopters. On 21 September 2004 he mobilized his unit in support of Operation Iraqi Freedom. 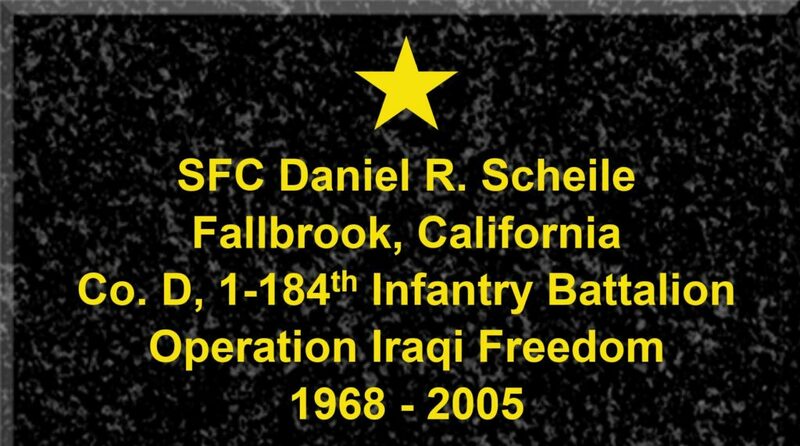 It is with deepest sympathy the California National Guard announces the death of Sergeant First Class Daniel Ronald Scheile, age 37, on 24 September 2005 in Baghdad, Iraq. Sergeant First Class Scheile died as a result of an IED and small arms fire He is survived by his wife Jennifer, daughters Kelli and Marissa, and parents. 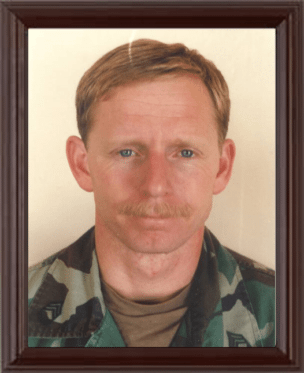 Sergeant First Class Scheile enlisted in the California National Guard in October of 1987. He served with the 570th Military Police Company, 579th Engineer Battalion and elements of the 1st Battalion, 184th Infantry. 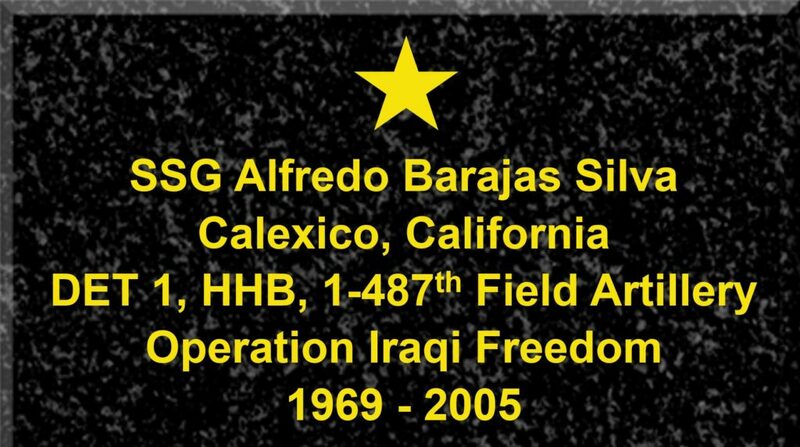 It is with deepest sympathy the California National Guard announces the death of Staff Sergeant Alfredo Barajas Silva, age 35, on 15 September 2005 in Baghdad, Iraq. Staff Sergeant Silva died as a result of an IED that struck his vehicle He is survived by his wife Cecelia, and daughter Mariel. 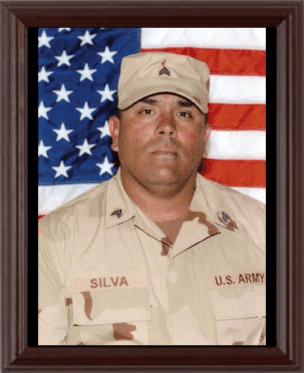 Staff Sergeant Silva enlisted in the California Army National Guard on 11 November 1998 with the Company B, 640th Division Aviation Support Battalion (DASB) after serving three years on active duty Army in Fort Hood, TX. In August of 2004 Staff Sergeant Silva was transferred to Detachment 1, HHB 1-487th FA as a Forward Observer and ordered to active duty for the purpose of OCONUS Deployment ISO Operation Iraqi Freedom. 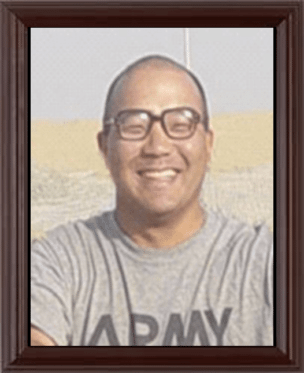 It is with deepest sympathy the California National Guard announces the death of Sergeant Mike Takeshi Sonoda Jr., age 34, on 22 September 2005 in Baghdad, Iraq. Sergeant Sonoda died as a result of an IED that struck his vehicle . He is survived by his father and mother. 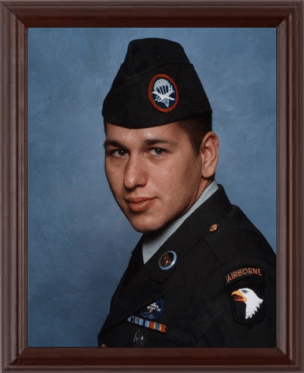 Sergeant Sonoda enlisted in the California Army National Guard in 1999 and was assigned to elements of the 1st Battalion, 184th Infantry (AASLT). From September of 2001 to March of 2002, Sergeant Sonoda served in Kuwait for Operation Enduring Freedom. 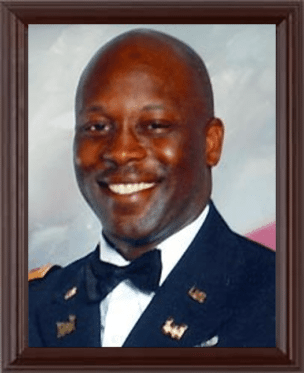 It is with deepest sympathy the California National Guard announces the death of Corporal Glenn James Watkins, 42, on 5 April 2005 in Baghdad, Iraq. 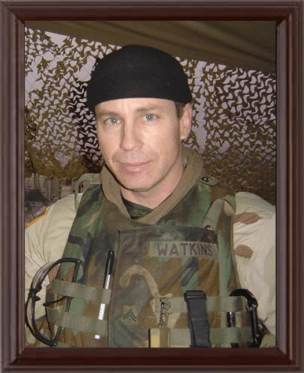 Corporal Watkins died as a result of his vehicle being destroyed by an improvised explosive device (IED). He is survived by his wife Anne, and four stepchildren. 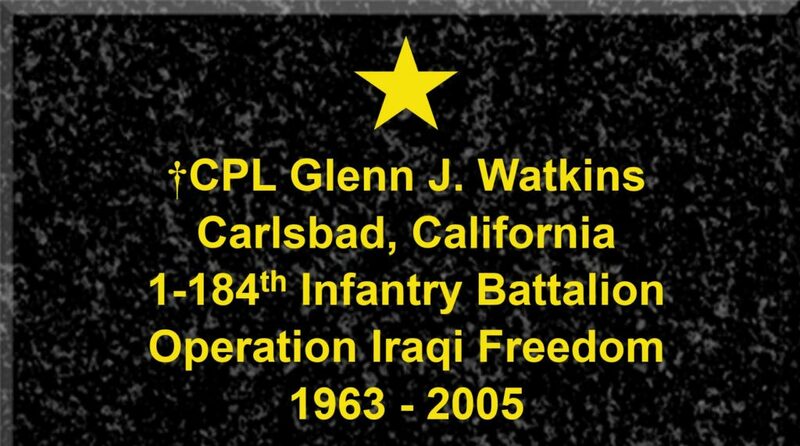 Corporal Watkins was deployed with Company B, 1st Battalion, 161st Infantry (TF Baghdad), Washington Army National Guard, and former member of Company A (-), 1st Battalion 184th Infantry, California Army National Guard, while serving in the War on Terrorism/Operation Iraqi Freedom. 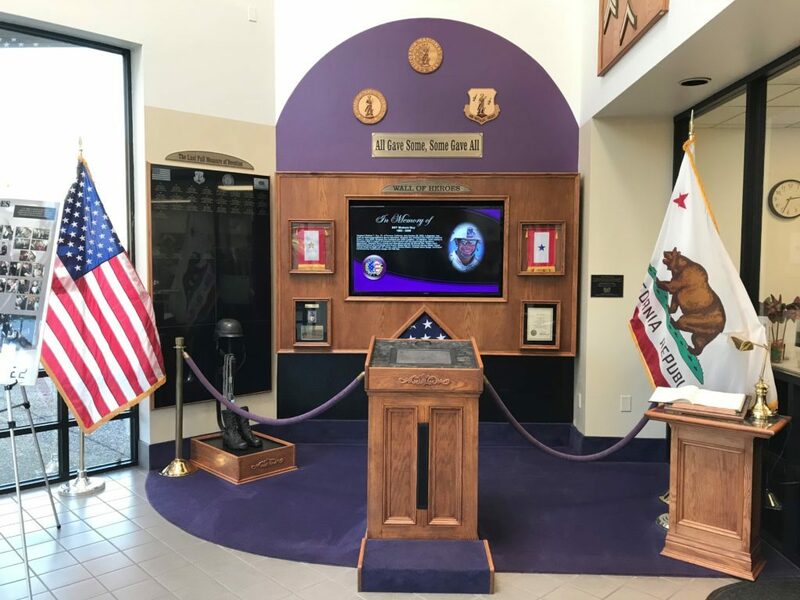 Corporal Watkins’ awards and decorations include the Bronze Star Medal, Purple Heart, Expert Infantry Badge, the Army Commendation Medal, Global War on Terrorism Expeditionary Medal. 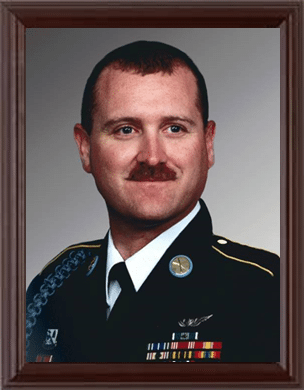 It is with deepest sympathy the California National Guard announces the death of Colonel William W. Wood, age 44, on 27 October 2005 in Baghdad, Iraq. 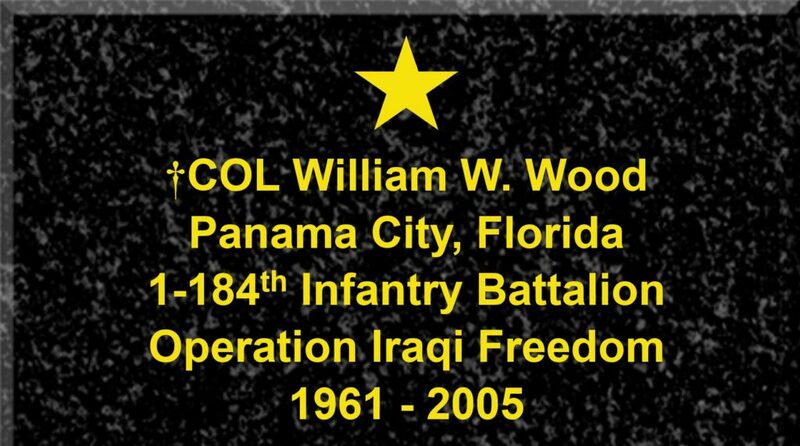 Colonel Wood died as a result of a improvised explosive device detonating while he was directing security operations in response to the detonation of another IED near his position. He is survived by his wife, Nanci, and a daughter. He was assigned to the 1st Battalion, 184th Infantry Regiment, California Army National Guard, Modesto, Calif. 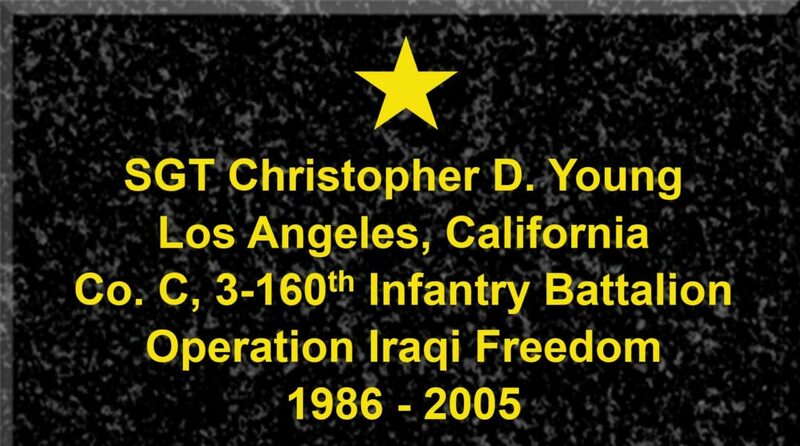 It is with deepest sympathy the California National Guard announces the death of Sergeant Christopher Dwayne Young, age 20, on 2 March 2007, at Camp Safwan, Iraq. Sergeant Young was the driver of an M1114 that struck an IED. He is survived by his parents Gina Wright and Joseph Young Jr. Sergeant Young enlisted in the California Army National Guard on 18 October 2005. He deployed in support Operation Iraqi Freedom on 22 August 2006. Sergeant Young’s awards include the Bronze Star, Purple Heart, Iraq Campaign Medal, Army Good Conduct Medal, Overseas Service Ribbon, Global War on Terrorism Service Medal, Combat Action Badge. 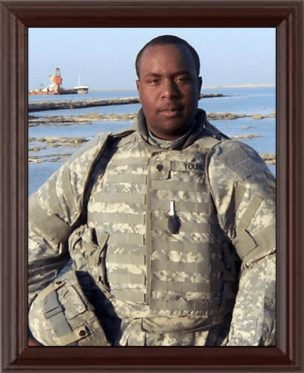 It is with deepest sympathy the California National Guard announces the death of Sergeant First Class Issac Lawson, age 35, on 5 June 2006 in Baghdad, Iraq. 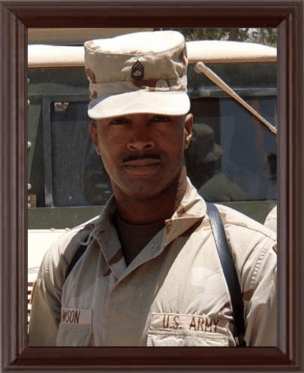 Sergeant First Class Lawson died as a result of injuries received when his vehicle struck an IED. He is survived by his wife Suzette, daughters; Chiara, Krystal and Andrea and stepsons Dominick T. Whitaker and Curtis Goldwire. 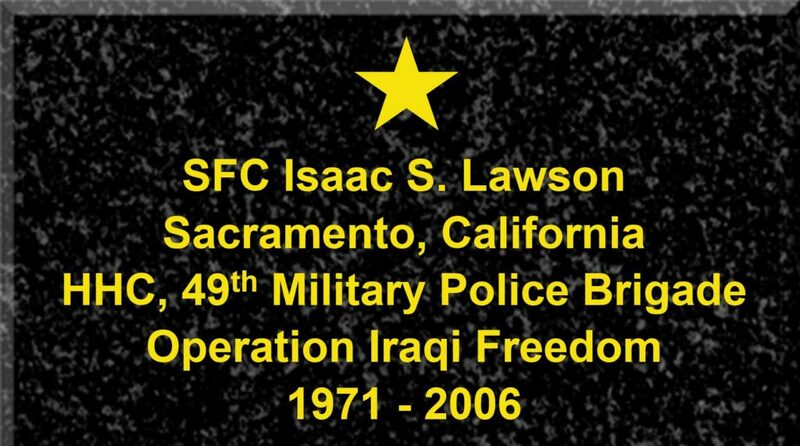 Sergeant First Class Issac Lawson was ordered to Iraq as part of the 49th Military Police Brigade. 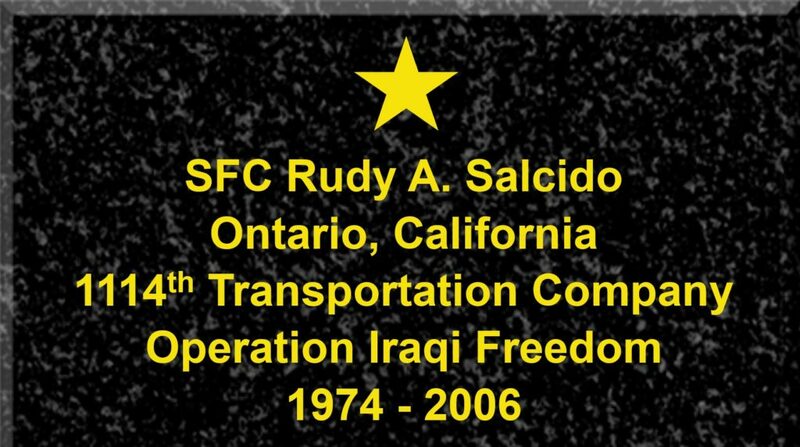 It is with deepest sympathy the California National Guard announces the death of Sergeant First Class Rudy Salcido, age 31, on 9 November 2006 in Baghdad, Iraq. Sergeant First Class Salcido died as a result of injuries received when his vehicle encountered an IED. He is survived by his wife, Jennifer, daughter Gabriella, father Peter Salcido, and mother Maybelle Luevano. Sergeant First Class Salcido enlisted in the California Army National Guard in May 2005 as a member of Troop A, 1st Squadron 18th Cavalry. On 5 May 2006, he was ordered to active duty with the 1114th Transportation Company in support of Operation Iraqi Freedom. Sergeant First Class Salcido’s awards include the Bronze Star, Purple Heart, Army Commendation Medal (2nd Award), Army Achievement Medal, Army Good Conduct Medal, and the Humanitarian Service Medal. 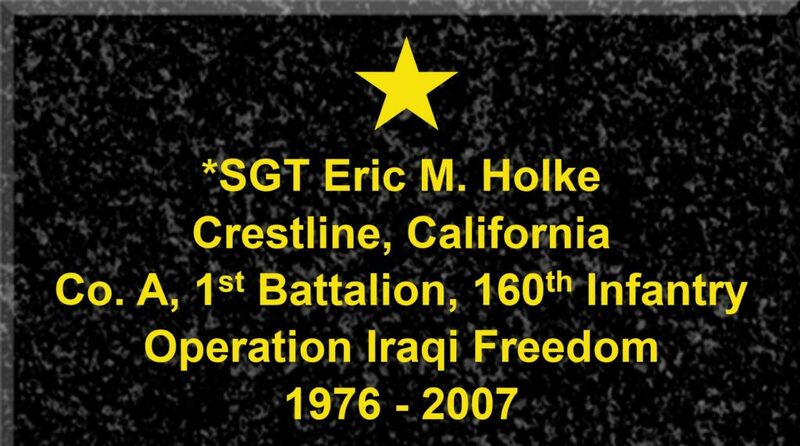 ​It is with deepest sympathy the California National Guard announces the death of Sergeant Eric M. Holke, age 31, on 15 July 2007 in Tallil, Iraq. Sergeant Holke died as a result from wounds sustained in motor vehicle rollover accident. He is survived by his wife, Cassidhe, and son Steven. 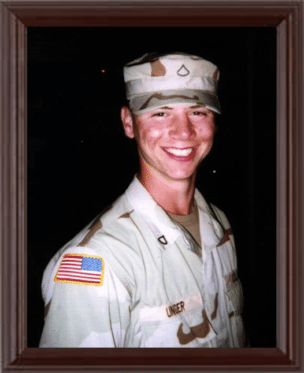 Specialist Holke enlisted in the California Army National Guard on 16 March 2006. On 2 March 2007, he was ordered to active duty for the purpose of OCONUS Deployment In Support Of Operation Iraqi Freedom. Sergeant Holke’s awards and decorations include the Bronze Star, Army Commendation Medal (2nd Award), Iraq Campaign Medal, Overseas Service Ribbon, Global War on Terrorism Service Medal, Global War on Terrorism Expeditionary Medal. 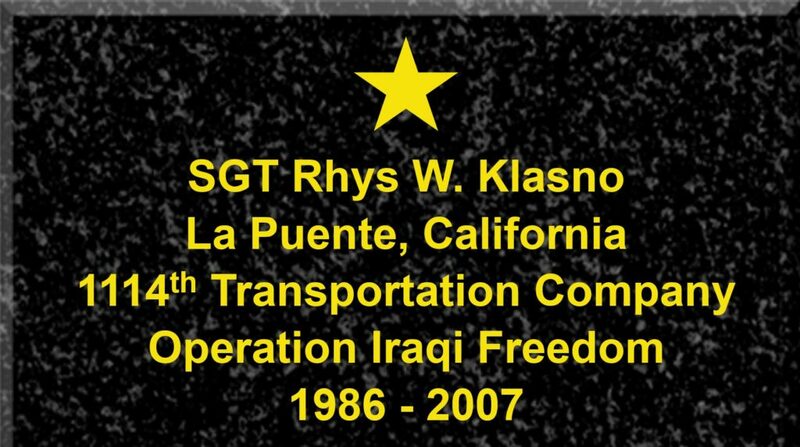 It is with deepest sympathy the California National Guard announces the death of Sergeant Rhys William Klasno, age 20, on 13 May 2007 in Al Asad, Iraq. Sergeant Klasno died as result when his vehicle was struck by an IED. He is survived by his wife Stephanie, mother, Andrea L. Jardinico and father, Michael Klasno. Sergeant Klasno enlisted in the California Army National Guard on 12 March 2004 as a member of Troop F, 1st Squadron 18th Cavalry. On 27 April 2006, Sergeant Klasno was ordered to active duty in support of Operation Iraqi Freedom with the 1114th Transportation Company. Sergeant Klasno’s awards and decorations include the Bronze Star, Purple Heart, Iraq Campaign Medal, Overseas Service Ribbon, Global War on Terrorism Service Medal, Combat Action Badge. 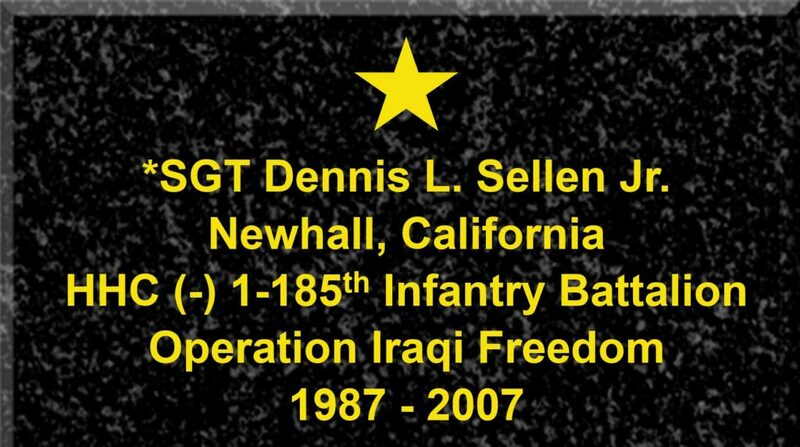 *Sergeant Dennis L. Sellen, Jr. 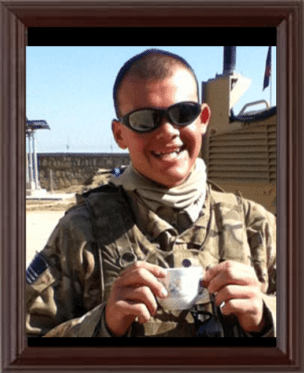 It is with deepest sympathy the California National Guard announces the death of Sergeant Dennis Lee Sellen Jr., age 20, on 11 February 2007 in Camp Bucca, Iraq. Sergeant Sellen is survived by his mother, Sylvia Sellen, and sister, Farah Barnwell. 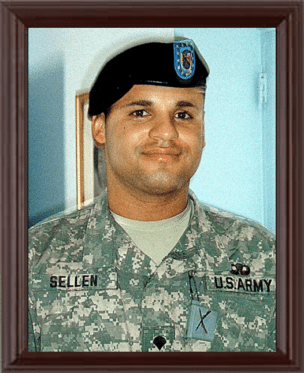 Sergeant Sellen enlisted in the California Army National Guard on 8 March 2006. On 24 June 2006, Sergeant Sellen deployed under ISO Operation Iraqi Freedom with the Headquarters and Headquarters Company (-), 1st Battalion 185th Infantry to support the 16th Military Police Brigade from Fort Bragg, North Carolina by providing convoy security throughout Iraq. Sergeant Sellen’s awards include the Army Good Conduct Medal, National Defense Service Medal, Iraq Campaign Medal, Army Service Ribbon, Overseas Service Ribbon, and Armed Forces Reserve Medal, Alabama. 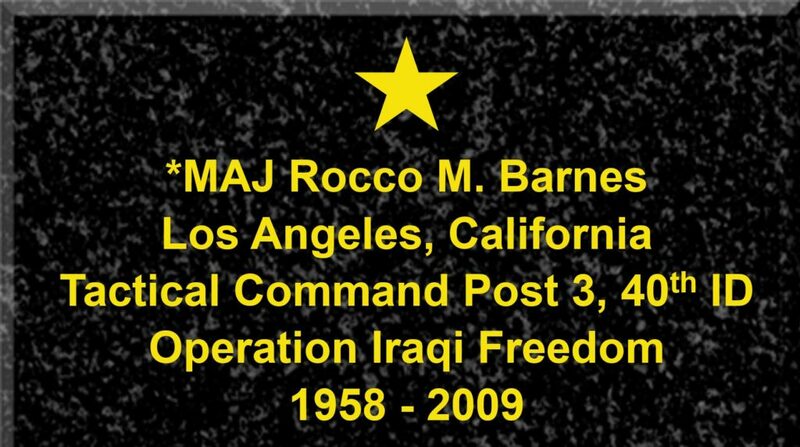 It is with deepest sympathy the California National Guard announces the death of Major Rocco Martin Barnes, age 51, on 4 June 2009 in Bagram, Afghanistan. Major Barnes dies as a result of injuries sustained due to a vehicle rollover. He is survived by his mother, Grace, father Harold, and sisters, Theresa and Jennifer Barnes. 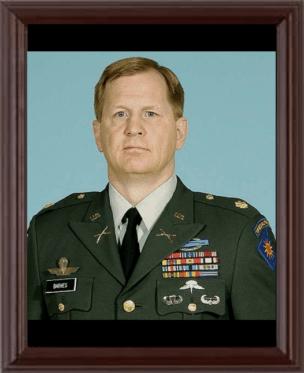 Major Barnes enlisted in the California Army National Guard in 25 March 1999 with CO A (-), Headquarters Detachment, 5th Battalion, 19th Special Forces Group. On 20 August 2008, Major Barnes was mobilized for Operation Enduring Freedom in support of the United States Marine Corps. Major Barnes’ awards include the Bronze Star (3rd Award), Meritorious Service Medal, Iraq Campaign Medal, Afghanistan Campaign Medal, Global war on Terrorism Service Medal, Special Forces Tab, Parachute Badge and Air Assault Badge. 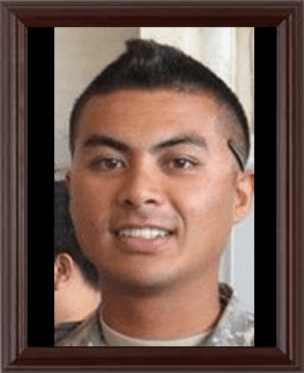 ​It is with deepest sympathy the California National Guard announces the death of Sergeant Carlo Francisco Eugenio, age 29, on 29 October 2011 in Kabul, Afghanistan. 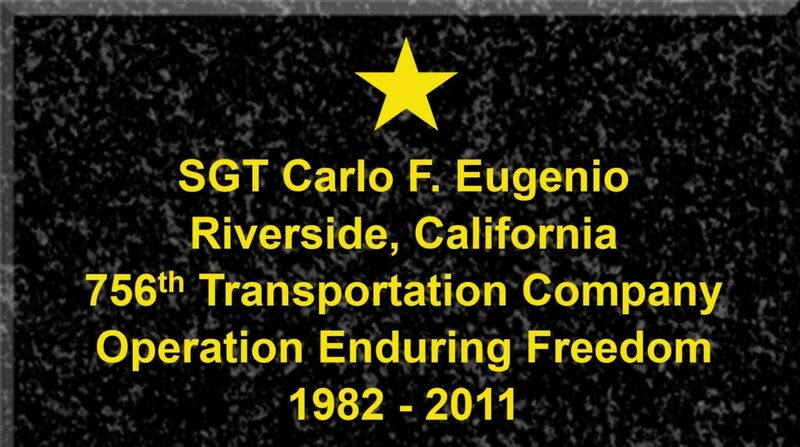 Sergeant Eugencio died as a result of injuries sustained when his vehicle was struck by an IED. He is survived by his father, Cesar Eugenio Sr, and mother, Noemi Eugenio. 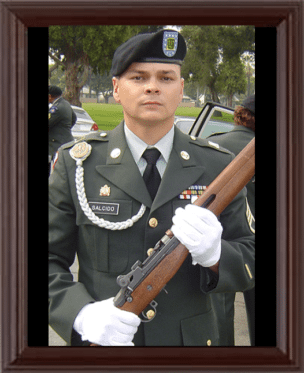 Sergeant Eugenio enlisted in the California Army National Guard on 28 April 2006. On 5 August 2011, he was ordered to active duty with the 756th Transportation Company in support of Operation Enduring Freedom. Sergeant Eugenio’s awards include the Bronze Star, Purple Heart, Army Commendation Medal, Afghanistan Campaign Medal (w/Bronze Service Star), Iraq Campaign Medal ((w/Bronze Service Star), Global War on Terrorism Service Medal. 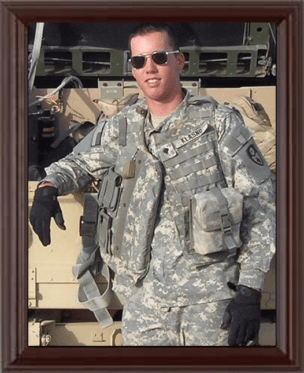 It is with deepest sympathy the California National Guard announces the death of Specialist Sean Michael Walsh, age 21, on 16 November 2011 in Camp Clark, Afghanistan. Specialist Walsh died as a result of direct impact of an indirect fire round while conducting physical training . He is survived by his mother, Cheryl Walsh; father, Kenneth Walsh. 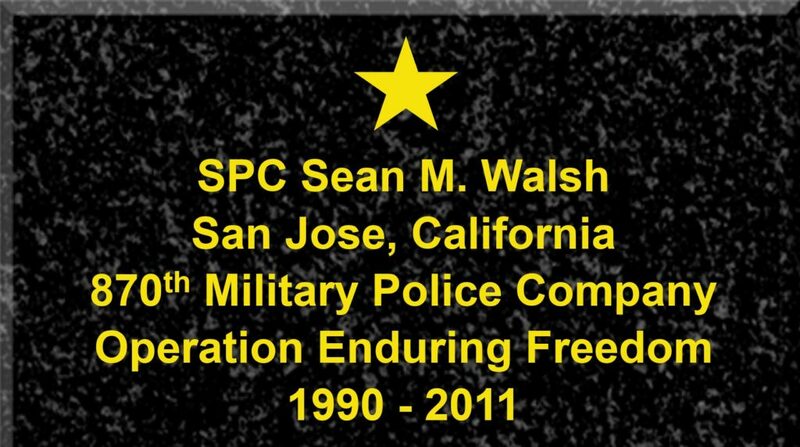 Specialist Walsh enlisted in the California Army National Guard on 20 October 2008 with the 870th Military Police Company. In December of 2010, Specialist Walsh was ordered to active duty in support of Operation Enduring Freedom. Specialist Walsh’s awards include the Bronze Star, Purple Heart, Army Commendation Medal, Afghanistan Campaign Medal (w/Bronze Service Star), Global War on Terrorism Service Medal, NATO Medal, Combat Action Badge. * These servicemembers’ deaths were classified by the Department of Defense as “non-hostile”. Non-hostile deaths are those where the circumstances are not directly attributable to hostile action or terrorist activity. † These service members were not assigned to the California National Guard at the time of their death, but were associated with CNG units or activities.